St. Louis has many choices when it comes to theater. You can see the latest shows straight from Broadway at the Fabulous Fox, or check out regional premieres of the hottest plays at The Rep. But no other theater experience is quite like the Muny in ​Forest Park. The Muny, or Municipal Opera, is the nation’s oldest and largest outdoor theater. It's been a summer tradition in St. Louis since 1918. Crews built the theater in just 49 days on a hill between two giant oak trees in Forest Park. Over the years, the Muny has attracted some of the country’s biggest stars. Lauren Bacall, Debbie Reynolds, Pearl Bailey and hundreds of others have appeared on the Muny stage. Each year, The Muny puts on seven shows starting in mid-June and ending in mid-August. Each season is typically a combination of returning favorites and new musicals. There are also often world premieres of brand new shows. And each season, there is one show that's geared more toward families and children. Shows start at 8:15 p.m., so the weather has usually cooled enough to be comfortable. Muny fans say there is nothing like sitting under the stars on a warm summer night watching a great show. They also say you’re not a Muny veteran unless you’ve sweltered through a performance when the temperature hits 100 degrees. Ice cream and frozen lemonade are a necessity on those nights. The Muny prides itself on presenting popular shows in ways you’ve never seen before. The productions are big, but we’re not just talking about elaborate sets and costumes. For example, you may see an authentic streetcar rolling by in Meet Me in St. Louis. 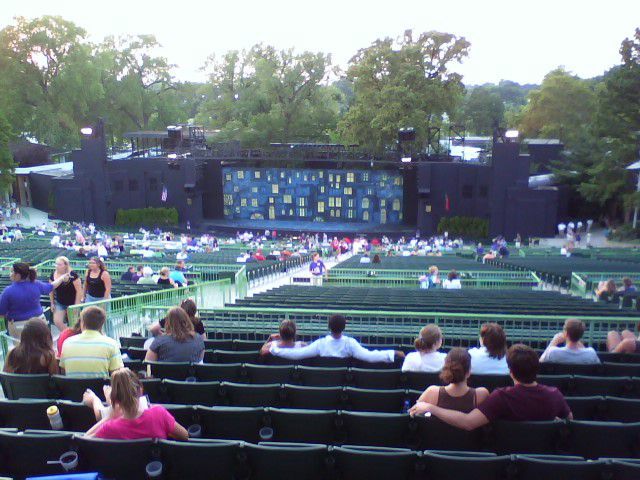 The Muny's large stage and outdoor setting are perfect for bringing such realistic elements to the shows. Ticket prices for the Muny are affordable, but you don’t have to pay at all. You can see one, or all seven, of the shows for free. The Muny has 11,000 seats, but for every performance about 1,500 are given away for free. The free seats are in the last nine rows of the theater and are available on a first come, first served basis. The gates for the free seats open at 7 p.m., and there is always a line. Many people bring a picnic and eat while they wait. If you’re seeing a show from the free seats it’s also a good idea to bring binoculars to get a good look at the action on the stage. For those preferring to buy a ticket, prices start at $14 for the back terrace and go up to $85 for box seats. Season ticket packages are also available. The Muny is located in the heart of Forest Park along Grand Drive. There is free parking, but the lots fill up quickly. If you prefer you can skip the parking and take the Munylink Shuttle. The shuttle goes from the theater to the Forest Park-Debaliviere Metrolink Station. No matter how you get to the Muny, it is a great way to spend a summer evening in St.
You can reach the Muny's box office by calling (314) 361-1900, or find out about upcoming shows, see seating charts and plan your visit on ​The Muny's website.